After two boys duke it out on a playground, the parents of the "victim" invite the parents of the "bully" over to work out their issues. A polite discussion of childrearing soon escalates into verbal warfare, with all four parents revealing their true colors. Carnage is a film directed by Roman Polanski, adapted from a play titled God of Carnage by Yasmina Reza. It premiered at the 2011 Venice International Film Festival. Armed with a powder keg of a premise, a high powered cast, and an accomplished director, this film was one of my most anticipated of the last year. I did find it mostly entertaining, but unfortunately the execution fell short of my expectations. The acting all seemed forced, and perhaps it's the result of this screenplay originally being written for the stage, but there is always the sense of 'playing to the back row'. That kind of delivery has never worked for me in a film, especially not a modern one shot in a detailed and realistic setting. The whole setup and the characters actions are not the least bit believable either, why the one couple stays and keeps staying when they clearly don't like each other and also have more important things to do just rings false. There are some very funny moments, especially from Kate Winslet's character, and it's entertaining to see how things rapidly devolve in real time. But in the end Carnage is a film that makes a lot of noise but doesn't have anything worthy to say. Another disappointment. I wanted to see this based on the actors involved and director, but it seems like the film itself falls short. Maybe I'll watch it one day, but my need has dropped off significantly. I found this really disappointing as well. I was so looking forward to it. Sometimes I love adaptations - I think Polanski did an amazing job with Death and Maiden. That is a brilliant film. But this was - exactly as you say - too forced. And WHY can't Penelope have a drink? That question was never answered and it bugged me. Too many plot holes. And I SO wanted this to be a good film! I agree with you that Winslet & Waltz staying the first few times was forced and contrived for the requirements of the one-room set-up, and also that it got a little histrionic towards the end (especially Foster), but I still really enjoyed watching these four go to town. I thought Polanski did a really good job within the confines of the single room, finding interesting camera angles and set-ups to keep it from being more stagy than inherently necessary. And though it didn't, as you mention, have anything in particular to SAY, on a line by line basis, I though the script was really good and witty. Great and meaningful cinema it may not be, but it was entertaining as hell. Damn. And I love those actors, too. Which is pretty much what I expected when I saw the trailer a while ago. I'd be disappointed in the people putting this through, but it was probably fun to make. I also anticipated this a lot but upon actually watching it I grew tired of it within twenty minutes. I felt the situation became increasingly silly and every moment created to make the couples stay together felt contrived. Oh and the gender jokes were stale. I saw 'Carnage' about a week after its debut outside Washington, DC. The film came out of the gate very strong and had a few solid memorable moments before fading. I kept thinking that Denis Leary, Judy Davis and Kevin Spacey had a better, more enjoyable time and created a better film with 'The Ref'. BTW: Any and all are invited to peruse and opine on my guest review of a minor 1960s classic over at 'Front Room Cinema'. I should have heeded the early warnings too. But curiosity got the better of me. I imagine it was quite the technical challenge to shoot it and make it feel like it's happening in real-time. I don't mind when the adaptation is done in such a way that makes the film real, like Incendies for example, and I do appreciate live theatre, but for some reason I really dislike when a film looks and feels like a stageplay. I guess it was an interesting albeit expensive film experiment, this would be something I would kill to see performed live with those actors. But the format and length really hampers the amount of believable story or character development we expect from a movie. I think what's most disappointing, is in the end the film doesn't live up to it's title. Haha, I know and despise people like this too, and maybe that's part of the reason why I didn't enjoy it as much as I could have. Yeah that aspect of the film is something I just can't get over. Luckily it was a relatively short feature. Thanks Jack, you are right about the Ref, I did enjoy that one far more than this. I read the same response on Nostra's review. I agree that when people don't like each other, it seems silly to keep being in the same room for that long. But the simple concept and turning it into a movie that impressed me. I guess when you see it in a play it's not really felt as forced. Maybe the story is not that believable, but I was entertained, and I loved the interaction between the characters- all 4 were very good! Great review! I must say your blog is a bit intimidating considering that you cover a lot of films I have not even heard of. 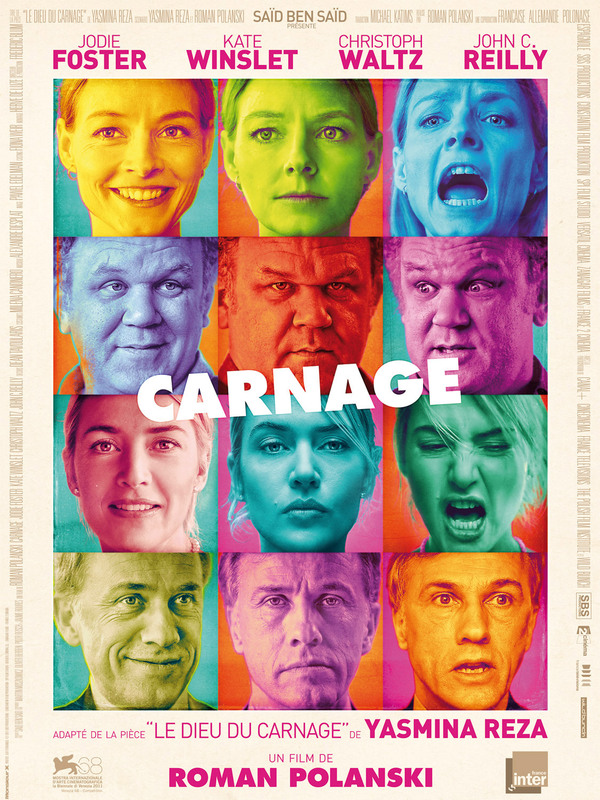 I have been on the fence on whether to see "Carnage" and while reviews like yours seem to point that I should stay away from it, there is something about Polanski directing a very talented group of actors that keeps pulling back to seeing it. I have read similar reviews to yours saying that the predicament seems a bit forced, and so do the rather theatrical performances by all of those involved. It certainly does not scream fresh and contemporary to me. Good read and great blog. I should be stopping by more often in the future. I thought this movie was good fun, though it did seem to stretch the believability of the concept at times. There were so many moments where the visiting couple could have just left, but they stuck around for some reason. Still not a bad way to spend 80 minutes. Thanks Niels, and welcome to my blog! I read those same reviews too but couldn't stay away because of the names involved here. It's not a terrible waste of time, but it just doesn't live up to expectations. Exactly. Just freaking leave already!! Haha. I finally caught up with this one, and I think I liked it a bit more than you did. I definitely agree that you can see the stage elements in it, but I didn't mind that as much. Fair enough. I can sometimes overlook that aspect for old films that are obviously shot on an artificial set, but just can't do it for new ones.